The first step on your Pathways journey is to choose your first Learning Path. My advice is to read through the descriptions of each Learning Path and the required projects in each to get an understanding of what each involves before you take the online assessment. Details are on our website. Once you have completed the assessment you are still free to choose any of the 10 Learning Paths and not just the ones recommended. 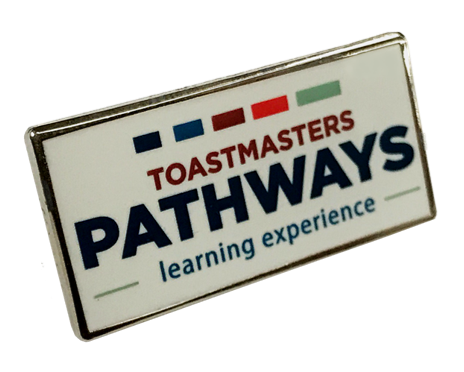 “I attended my first Club meeting in January 2018 so I have no experience or knowledge of the Toastmasters modules to make a comparison. However I did find the Pathways platform very user friendly and detailed. I logged on as advised on the Toastmasters website to access Pathways; as with any new website or platform it takes a short while to familiarise yourself with the navigation structure and content layout. But as I entered Pathways I scrolled down to the bottom of first landing page; Home/Pathways learning experience, clicked on that and my Pathway has begun. I instantly noticed the time, effort and thought that has gone into developing this project; the process is very intuitive and includes video content, content text and supportive information for your mental state/nerves. Your personal self-assessments are at the start and end of the project which proved very helpful; this closes the loop to reflect back on oneself and what has been achieved or not. For more information on Pathways take a look at this handy Pathways paths and projects catalogue. I look forward to hearing many more of your stories over the coming months and hope that every club will have its own Pathways Pioneers, leading and supporting their members.